I am a homemaker, and the home I make is in a small, sometimes cluttered, old house that we love. I found these photos of it before we moved in. I had prayed about having a family focused, down-sized life. We'd moved and were bouncing back from some hard times and needed a "starter" home. We did not need a place to amass more stuff. It worked out great because what we got was a very small, inexpensive, home that was almost a hundred years old, where it's easy to focus on each other because we're crammed in here like sardines. You can see where a front porch was taken in to enlarge the living room, so the living room floor was partially virgin wood. Floral panelling everywhere. 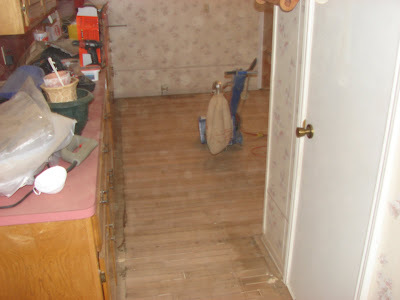 We visited the elderly couple who'd lived there so many years and I tried to imagine the completely carpeted floors, even in the kitchen, stripped and refinished (sometimes squinting and blurring the eyes helps.) I was squinting alot- at recliners, "country" panelling, etc. But we bought without a clear idea of how we'd make it work, sensing it was the right place for us. Ah, the bathroom that is almost in the kitchen. Remember, togetherness is our goal! I can envision it as being the neatest little vintage room in the house (lots of squinting and blurring going on here) but for now it's still a dark little cave. 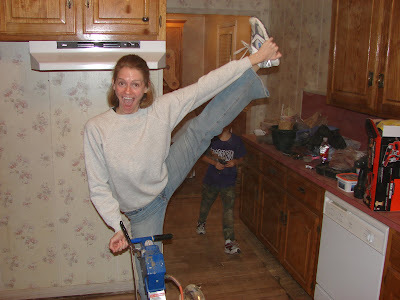 The kitchen was smaller still, with a stove and fridge under the high cabinets, where I look so excited about refinishing floors. The formica counter wasn't and still isn't our most favorite. Almost every room is an add-on. 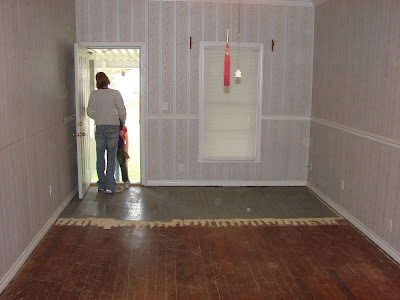 It was interesting to see where little rooms had been added with different kinds of wood used on the floors. 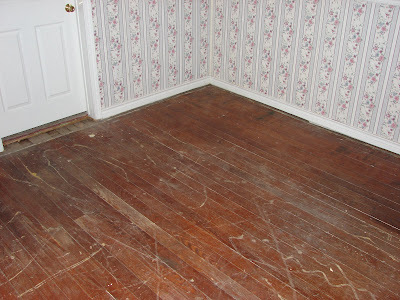 The floor in the kids' rooms are in the best condition. My son wasn't exactly thrilled to get the one with little roses on the walls, but they were easily painted over. 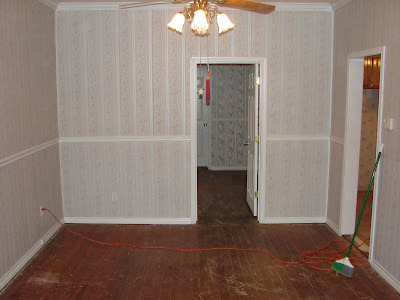 Priming and paint were all we did to improve the walls, rather than re- sheetrock. 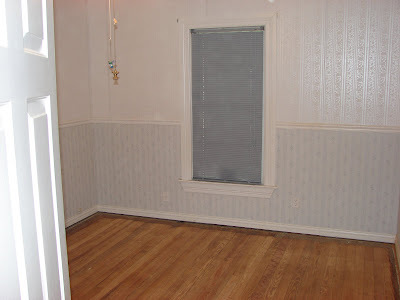 I minimized the disparity between the old front porch and the rest of the living room floor by rubbing brown paint into the raw wood to dirty it up before finishing them. Now that we see the effect our beastly lab's claws have on the floor, we realize we should have put down more sealer. Won't that be fun to correct? Somehow we fit our table, fridge, and stove in there, moving the gas valve and accepting that the fridge sticks out like a sore thumb. Well- meaning friends call it "cozy" as they step over the dog to get to the stove. Small as our kitchen is, everyone gravitates to it. I realize this "after" photo is almost as cluttered as the before.